27 species; see list of rattlesnake species and subspecies. Rattlesnake is the common name for any of the venomous snakes comprising the genera Crotalus and Sistrurus of the pit viper subfamily Crotalinae and the viper family Viperidae, characterized by a triangular head, a heat-sensing pit organ located between the eye and the nostril on either side of the head, and a rattle at the end of the tail. The rattle consists of a series of horny, hollow segments of skin, loosely attached, that can be vibrated or shaken to make a rattling or buzzing sound. As a snake, rattlesnakes are elongate, limbless, scaled, and carnivorous reptiles placed within the suborder Serpentes (or Ophidia) of the order Squamata. As with other snakes, they lack movable eyelids, lack external ear openings, and have only one lung functional for breathing. Rattlesnakes are members of the family Viperidae, a family of venomous snakes commonly referred to as vipers, although the term viperids is more specific and distinguishes them from the viperines (subfamily Viperinae). All viperids have a pair of relatively long solenoglyphous (hollow) fangs, that are used to inject venom from glands located towards the rear of the upper jaws. Each of the two fangs is at the front of the mouth on a short maxillary bone that can rotate back and forth. When not in use, the fangs fold back against the roof of the mouth and are enclosed in a membranous sheath. The left and right fangs can be rotated together or independently. During a strike, the mouth can open nearly 180° and the maxilla rotates forward, erecting the fang. The jaws close on impact and powerful muscles that surround the venom glands contract to inject the venom as the fangs penetrate. This action is very fast; in defensive strikes it can be more a stab than a bite. Viperids use this mechanism both to immobilize their prey and in self-defense. Rattlesnakes are members of the subfamily Crotalinae. The crotalines, which are found in Asia and the Americas, are distinguished by the presence of a heat-sensing pit organ located between the eye and the nostril on either side of the head. These deep pits are sensitive to infrared radiation, in effect giving the snakes a sixth sense that helps them to find and perhaps even judge the size of the small warm-blooded prey on which they feed (Campbell and Lamar 2004). Crotalines are the only viperids found in the Americas. A common name for members of Crotalinae are pit vipers (Mehrtens 1987) or pitvipers (Campbell and Lamar 2004). 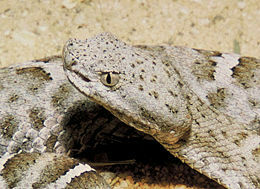 Rattlesnakes comprise two genera within Crotalinae: Sistrurus and Crotalus. Sistrurus species differ from the larger rattlesnakes of the genus Crotalus in a number of ways. They are smaller in size, but also their scalation is different: Sistrurus species have nine large head plates (same as Agkistrodon), whereas with Crotalus (and almost all other viperids) the head is mostly covered with a large number of smaller scales. Sistrurus species have a relatively small rattle that produces more of a high-pitched, buzzing sound than a rattle, like Crotalus. The scientific name Crotalus derives from the Greek, κρόταλον, meaning "castanet." The name Sistrurus is the Latinized form of the Greek word for "tail rattler" (Σείστρουρος, Seistrouros) and shares its root with the ancient Egyptian musical instrument, the sistrum, a type of rattle. There are approximately fifty species of rattlesnake, with numerous subspecies. They receive their name for the rattle located at the tip of their tails. The rattle is used as a warning device when threatened. Most rattlesnakes mate in the spring. All species give live birth, rather than laying eggs. The young are self-sufficient from birth. As they do not need their mother after birth, the mother does not remain with her young. Rattlesnakes consume rodents, such as rats and mice, as well as other small animals, such as rabbits. They subdue their prey quickly with a venomous bite as opposed to constricting. They are specially known to strike at distances up to two-thirds their body length. The venom stuns or kills typical rattlesnake prey immediately. A rattlesnake will follow prey that does not quickly succumb to the venom and attempts to escape. Rattlesnakes are prey for kingsnakes, roadrunners, pigs, hawks, and eagles. They have been harvested as human food. The rattle of a rattlesnake. The rattle is composed of a series of nested, hollow beads or shells, each of which was at one point the scale covering the tip of the tail. In most other snakes, the tail tip, or terminal spine, is cone-shaped, hardly any thicker than the rest of the skin, and is shed along with it at each successive molt. In this case, however, the end-scale, or "button," is much thicker and shaped like a bulb with one or two annular constrictions that prevent it from falling off. Before each molt, a new button will have developed inside the last, one and before the skin is shed, the tip of new button shrinks, thereby loosening the shell of the previous one. Each time the snake sheds its skin, a new rattle segment is added. This process continues so that a succession of molts produces an appendage that consists of a number of interlocking segments that make an audible noise when vibrated. Rattlesnakes may shed their skins several times a year depending on food supply and growth rates. Since younger specimens may shed three to four times in a year, every time adding a new segment to the rattle, and since the rattle may break off, it is inaccurate to claim that one can tell a rattlesnake's age from the number of beads in its rattle. End segments tend to break off after the rattle becomes about six or seven segments long; thus it is uncommon to find specimens with as many as a dozen segments (Parker and Grandison 1977; Stidworthy 1974). While adult snakes may lose their rattles on occasion, more do appear at each molting. If the rattle absorbs enough water in wet weather, it will not make noise. Newborn rattlesnakes do not have functional rattles; it is not until after they have shed their skin for the first time that they gain an additional bead, which beats against the first bead, known as the button, to create the rattling sound. Rattlesnake in British Columbia, Canada. Different species of rattlesnake vary significantly in size, territory, markings, and temperament. If the rattlesnake is not cornered or imminently threatened, it will usually attempt to flee from encounters with humans, but will not always do so. Bites often occur when humans startle the snake or provoke it. Those bitten while provoking rattlesnakes have usually underestimated the range (roughly two-thirds of its total length) and speed with which a coiled snake can strike (literally faster than the human eye can follow). Be aware that they can actually strike without pulling their body back into the famous "S" coil shape first and they may strike without any warning if feeling threatened. Heavy boots and long pants reinforced with leather or canvas are recommended when hiking in areas known to harbor rattlesnakes. For learning how to quickly and safely identify rattlesnakes by their markings, guides are available through booksellers, libraries, and local conservation and wildlife management agencies. The best way to avoid contact with rattlesnakes is to remain observant and avoid potential encounters. Hikers should always watch their steps when negotiating fallen logs or boulders and take extra caution when near rocky outcroppings and ledges where rattlesnakes may be hiding or sunning themselves. Snakes will occasionally sun themselves in the middle of a trail, so always watch your step. When encountering a rattlesnake on a trail, keep your distance and allow the snake room to retreat. Pets should be kept leashed to prevent them from provoking a rattlesnake. Rattlesnakes are born with fully functioning fangs capable of injecting venom and can regulate the amount of venom they inject when biting. Generally, they deliver a full dose of venom to their prey, but may deliver less venom or none at all when biting defensively. A frightened or injured snake may not exercise such control. Young snakes, although incapable of delivering an amount of venom equivalent to their adult counterparts, are still potentially deadly. Any bite must be considered dangerous and professional medical care should immediately be sought. Most species of rattlesnakes have hemotoxic venom, destroying tissue, degenerating organs, and causing coagulopathy (disrupted blood clotting). Some degree of permanent scarring is very likely in the event of a venomous bite, even with prompt, effective treatment, and a severe envenomation, combined with delayed or ineffective treatment, can lead to the loss of a limb and rarely, death. Thus, a rattlesnake bite is always a potentially serious, or even fatal, injury. Untreated rattlesnake bites, especially from larger species, are very often fatal. However, antivenin, when applied in time, reduces the death rate to less than four percent. Around 8,000 people are bitten by venomous snakes in the United States each year. On average, fewer than 15 snakebite deaths are reported. Some rattlesnakes, especially the tropical species, have neurotoxic venom. A bite from these snakes can interfere with the function of the heart, paralyze the lungs, and shut down parts of the nervous system. When a bite occurs, the amount of venom injected cannot be gauged easily. Symptoms and swelling may occur quickly, and may cause death easily, but in some cases hours may pass before serious effects appear. Experienced health workers typically gauge envenomation in stages ranging from zero, when there is no evident venom, to five, when there is a life-threatening amount of venom present. The stages reflect the amount of bruising and swelling around the fang marks and the speed with which that bruising and swelling progresses. In more severe envenomation cases (stage four or five) there may also be proximal symptoms, such as lip-tingling, dizziness, bleeding, vomiting, or shock. Difficulty breathing, paralysis, drooling, and massive hemorrhaging are also common symptoms. 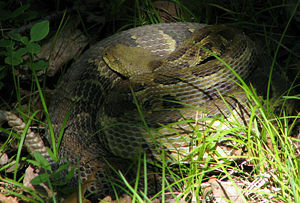 When bitten by a rattlesnake, quick medical attention is critical, and treatment typically requires antivenin/antivenom to block the tissue destruction, nerve effects, and blood-clotting disorders common with rattlesnake venom, Most medical experts recommend keeping the area of the bite below the level of the heart. It is important to keep a snake bite victim calm in order to avoid elevating their heart rate and accelerating the circulation of venom within the body. Untrained individuals should not attempt to make incisions at or around bite sites, or to use tourniquets, as either treatment may be more destructive than the envenomation itself. Any bite from a rattlesnake should be treated as a life-threatening medical emergency that requires immediate hospital treatment from trained professionals. Campbell, J. A., and W. W. Lamar. 2004. The Venomous Reptiles of the Western Hemisphere. Ithaca and London: Comstock Publishing Associates. ISBN 0801441412. Parker, H. W., and A. G. C. Grandison. 1977. Snakes: A Natural History, 2nd edition. British Museum (Natural History) and Cornell University Press. ISBN 0801410959. Rubio, M. 1998. Rattlesnake: A Portrait of a Predator. Smithsonian Institute Press. ISBN 1560988088. Stidworthy, J. 1974. Snakes of the World. Grosset & Dunlap Inc. ISBN 0448118564. This page was last modified on 25 June 2015, at 21:20.